Roche, one of the world's largest pharmaceutical companies, is all about discovery. It is evident in the Palo Alto, CA facility where they focus on early discovery research in virology and IAT (inflammation, autoimmune and transplantation), and it extends to the ways that the company communicates with its employees. Late last year a group of Roche Palo Alto managers met to discuss employee communications. They wanted to build on their intranet, email newsletter, posters and other communications tools in order to facilitate the speed and fluidity of communications. They also wanted to address the issue of unsightly flyers and posters that had become the method of choice for employee-sourced announcements. Ron Fuchs, vice president of communications and public affairs, offered to research digital signs. Commented Fuchs, "I had used digital signage at a previous company and I thought that this would be something to explore. I remember it being a fairly robust, powerful and expensive system, but I didn't have that kind of budget for this site." First, he looked within Roche but did not find a signage system that met his needs and budget. Fuchs then conducted an Internet search and found StrandVision. He contacted StrandVision's Amy Hansen and received additional information that he shared with his IT colleagues at the facility. StrandVision's hosted service approach made sense and the cost was so reasonable that Fuchs concluded that there was virtually no risk. They decided to start with two large plasma screens in the cafeteria - one by the cash registers - the other in the dining area. As a pass-through point for the entire 1,000-employee campus, 500-600 people go through the cafeteria line every day. Fuchs made arrangements with the facilities people to mount the monitors and run the electrical and network cabling. IT contributed the computers and handled the Internet connection. StrandVision offered training and walked Fuchs through the setup. The support did not end with the sale, however. Roche uses a lot of PowerPoint-formatted slides for the digital signage system. Said Fuchs, "They weren't converting right, so I talked with Amy and she spoke with Mike [Strand] and he built a JPEG conversion capability. This was incredibly helpful." Fuchs also asked StrandVision to add the Swiss franc to its monetary conversion table. Said Fuchs, "I've been very impressed with their level of responsiveness and support." Fuchs found that updating the digital signage is easy. He and his team are able to quickly make updates even in the few minutes between meetings. "I can easily plug something in and make an adjustment just to give it some variety. It's such a cool tool." Now, a new communications channel is open that efficiently reaches employees with company announcements and more. Employees are encouraged to participate by submitting announcements and even photos with the added benefit of all but eliminating the unsightly flyers and notices. "People submit some really nice digital photography. It enhances morale, builds a sense of community and keeps the signage interesting. "A number of employees have come up to me and told me that they love the signage. They think that it's a neat way to communicate their announcements about everything from recreational activities to science seminars. 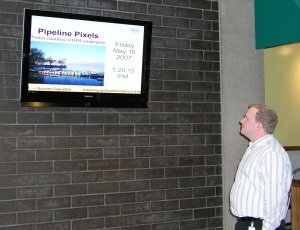 "The digital signage is being used by various groups right now. For a site of 1,000 people, we have a fairly robust internal comms program. This adds another channel that's helpful," concluded Fuchs.